House Leadership has scheduled a last-minute floor vote for TOMORROW in an attempt to cram DANGEROUS ID into law here in Minnesota – whether we like it or not. This bill is very bad news for gun owners. Please watch this urgent update from Political Director Ben Dorr and take IMMEDIATE action to oppose this anti-gun legislation. When you’re done, please click on the link to find out who represents you and then call your State Representative and Senator and tell them to vote NO on Dangerous ID. It’s well known that DANGEROUS ID is Pandora’s Box for gun owners. It’s loaded down with anti-gun language that provides the opportunity for aggressive back-door attacks on our gun rights in the future. If Dangerous ID passes, it will give the Secretary of the Department of Homeland Security the ARBITRARY power to require that you and I have a “Real ID” license to purchase firearms, ammunition, health care etc. The Minnesota legislature should be standing up to Government and telling them to pound sand, not surrendering our State’s rights! So please, click on the link and call your Representative and tell them to vote NO on Dangerous Id tomorrow. Don’t let them spin you! They’ll tell you that if you don’t want a Dangerous ID, you don’t have to get one. But the truth is that under Real ID law, BOTH forms of Minnesota ID will give your most personal data and information to the Federal Government. In an attempt to scare you into submission, they’ll tell you that a Dangerous ID is needed if you want to fly on an airplane in and out of Minnesota. It’s simply “leadership” and the liberal media’s way of sugar coating a bad bill and forcing it down our throats – whether we like it or not. So please call them immediately tell them to vote NO on Dangerous ID. Make sure they understand that gun owners will hold them accountable at election time for their votes tomorrow. 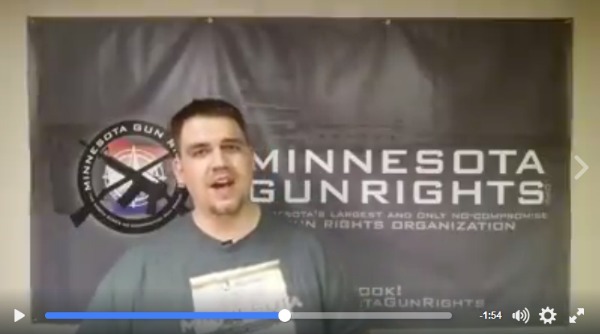 Minnesota Gun Rights will be on the ground in St Paul tomorrow running LIVE video updates to keep you informed. Please click the link to follow us on Facebook and get up to the minute updates on your gun rights. Thank you for your phone calls and we’ll keep you informed! P.S. The Minnesota House is going to vote on the anti-gun Dangerous ID TOMORROW. Please watch the video above and contact your Representative IMMEDIATELY and tell them to vote NO on Dangerous ID!